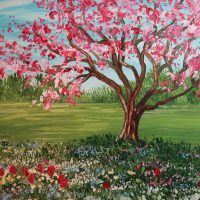 Learn to paint something beautiful and support a great cause! Join us at the Camino Real in Berryville, VA for a fun afternoon of painting, and help us help others all at the same time! We’ll start off with a delicious Taco Bar lunch, and then receive step-by-step guidance to complete a beautiful spring landscape. All supplies will be provided, and don’t worry, no prior art experience is necessary! Profits raised benefit the vital work of the Alzheimer’s Association. General Admission $60 Fee includes instruction, all supplies, as well as a delicious Taco Bar from 12:00-1:00 (with chicken, beef and all the fixings!) and soda, tea and water. Get Your Tickets Today! Click Here Space and supplies are limited to 30 participants. I’m excited to partner with Team Greenfield again this year to help raise money in support of the Alzheimer’s Association. Last year our art party event raised over $1,000! Posted in: Art Party, Calendar of Events, Community Outreach, News.